.NTSA SEIZURE.Up for sale is a used stainless steel KERSHAW "KEN ONION" USA CHIVE 1600PINK folding/linerlock knife. The KERSHAW CHIVE 1600PINK linerlock knife is 3" closed and 4 7/8" open length. RAT I Linerlock. 5" closed. 3.5" satin finish AUS-8 stainless drop point blade. Pink textured nylon handle. Thumb stud. Lanyard hole. Pocket clip. Handle: Pink nylon. Spring Assisted Knife. 3.8" 3MM THICK BLADE, STAINLESS STEEL. HEAT TRANSFER PAINTED BLADE. Great finishes on surface. Made in Germany. Tac-Force Spring Assisted tactical Rescue knife. Excellent quality knife with sharp blade. Elk Ridge Pink Camo Ballistic Linerlock Spring Assisted Knife. 7 5/8" (194mm) opened. 4 1/4" (108mm) closed. 3 3/8" (86mm) Mirror finish 440 stainless spring assisted opening blade with extended tang and dual thumb studs with Elk Ridge cut out. This 8" Tac Force spring assisted folding knife is the perfect tool to carry around in your pocket. Featuring a sharp and durable stainless steel blade, this knife will get the job done. Tac Force Spring Assisted Folding Knife. RAT I Linerlock. 5" closed. 3.5" black finish AUS-8 stainless drop point blade. Pink textured nylon handle. Thumb stud. Lanyard hole. Pocket clip. Blade Length: 3.5". CUSTOM HANDMADE DAMASCUS STEEL FOLDING KNIFE LINER LOCK. BOLSTER = DAMASCUS STEEL. FIRE STORM PATTERN DAMASCUS STEEL BLADE, SHARP EDGES. Damascus steel of this knife has high quality contents to give an excellent edge and sharp cutting abilities. Item Number: 1600PINK. The blade is made of high-carbon 420HC stainless steel for good edge retention, easy resharpening, and excellent toughness. Our newest handle is anodized aluminum in fashionable pink. We don't just send you whatever is in the box. Easy Open back tabbing with your pointing finger or thumb stud to open. 1045 Surgical Steel Blade (Tool Blade). 4" Closed, 3.25" blade. Handle: Pink inlay Handle. This is a NEW in the box Numbered C143GPNP Large Chinese Folder model folding knife, Collectors Club knife numbered 161 of 200. The C143GPNP Large Chinese Folder is a pink G-10 handled with VG-10 blade steel. THE KNIFE HAVE TWO MODE,Stone washed Blade、Fine sanding Blade,WHEN YOU ORDER,NOTE WHAT MODE DO YOU WANT. Knife handle:Titanium alloy. 1 Folding Knife. Other: With titanium alloy waist clip. Blade length:8.8cm. Brand New! Comes in Box! Made for the great outdoorswoman in your life, the Kershaw Pink Chive Plain Edge Knife is crafted out of a pink anodized aluminum handle and very practical 420HC stainless steel. 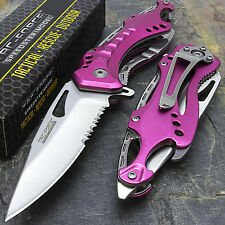 It’s an elegant blade and color designed for a survivalist that wants to sport a little pink in their tool box. MASTER USA MU-A010PK SPRING ASSISTED KNIFE. SPRING ASSISTED. 3.25" 3MM THICK BLADE, STAINLESS STEEL. BLACK HALF SERRATED BLADE. INCLUDES POCKET CLIP, SEAT BELT CUTTER AND GLASS BREAKER. Edge material: m390 (hardness 59±1). Material: TC4 titanium alloy handle, titanium alloy coating, titanium alloy main shaft screw. This Tac Force 7.75" spring assisted folding knife is the perfect tool to carry around in your pocket. Featuring a sharp and durable half serrated stainless steel blade, this knife will get the job done. Kershaw Chive A/O Pink Knife KS1600P 2 7/8" closed linerlock. 420HC stainless bl. 420HC stainless blade with dual thumb studs. Pink anodized aluminum handles with stainless pocket clip. Lanyard hole. Blade Steel:S35VN. Knife handle:TC4 titanium alloy. 1 Folding Knife. 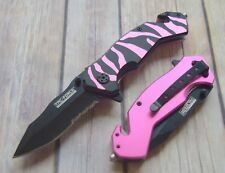 THE KNIFE HAVE TWO COLOR,Blue、PINK,WHEN YOU ORDER,NOTE WHAT COLOR DO YOU WANT. Other: With titanium alloy waist clip. Blade length:8.8cm. Blade material: m390. Handle: Japan imports titanium alloy TC4 rosewood. Blade length: 70mm. Blade width: 18mm. Blade thickness: 2.3mm. Blade face: sanding. Handle thickness: 10mm. (Other countries or remote areas may take longer). Beautiful Ornate Artwork on the Brass Bolster and Blade. Thumb Studs for easy opening. Rose Wood Handle. Fast Spring Assist Opening. Blade Length: 3.75". Handle Length: 4.75". Sharp Stainless Steel Blades. And no wonder. Chives are the perfect pocketknives. And, of course, they are made of top quality materials. Each blade is manufactured of high-carbon 420CH stainless steel for good edge retention, easy re-sharpening, and excellent toughness. 5" closed linerlock. 3 1/2" AUS-8 stainless blade with dual thumb studs and thumb ridge. Textured pink nylon handles. Lanyard hole. Four-way reversible black finish stainless pocket clip. New Kershaw 2 7/8" closed linerlock. 420HC stainless blade with dual thumb studs. Pink anodized aluminum handles with stainless pocket clip. Lanyard hole. Speed-Safe assisted opening system. Red & Green Dot Optics. Snake Eye Tactical Action Assist Survival Pocket Knife. Includes Seat Belt Cutter and Pocket Clip. All Black Half Serrated Stainless Steel Blade. New Elk Ridge Linerlock A/O Carbon Fiber Pnk 4 1/4" closed. 3 1/2" mirror polished 440 stainless assisted opening clip point blade with dual thumb studs, extended tang and laser logo cutout. Pink camo carbon fiber coated stainless handles with silver finish aluminum inlay. 5" closed. 3.75" satin finish S35VN steel blade. Pink anodized titanium handle. Extended tang. Lanyard hole. Pocket clip. Black nylon zippered storage case. The Yangjiang, China-based maker has been readying its catalog of more than 30 initial models for nearly a year. Kershaw Knives 2 7/8" closed linerlock. 420HC stainless blade with dual thumb st. 420HC stainless blade with dual thumb studs. Pink anodized aluminum handles with stainless pocket clip. Lanyard hole. Snake Eye Tactical Survival Style Folding Knife. 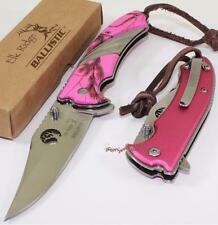 Pink Camouflage Designed Handle w/ Pocket Clip. All Black Stainless Steel Blade. Brand New. Tac-Force/Snake Eye Spring Assisted Knife. 8" opened. 4.5" closed. 3.5" Black 440 stainless steel assisted opening blade with extended tang and thumb stud. Pink handles with Black stainless steel bolsters. Black finished stainless steel pocket clip. Flipper on spine of knife allows for easy fast right or left handed opening. Blade type:Spear Point and Serrated. Spring Assisted Folding Pocket Knife. This is a sharp, functional, durable, super fast and easy opening spring assisted pocket knife that works well for any task. Woods Cross, UT 84087. 1199 W 2425 S. Need help?. For any other reason. Elk Ridge Linerlock A/O Carbon Fiber Pnk 4 1/4" closed. 3 1/2" mirror polished 440 stainless assisted opening clip point blade with dual thumb studs, extended tang and laser logo cutout. Pink camo carbon fiber coated stainless handles with silver finish aluminum inlay. Assisted Opening Stiletto! “DUCK” Pink Camo Stiletto”. Stiletto Sharp! Part Serrated! Dagger Style Blade! Blade Etched “Duck with Duck Logo! Highly Collectable Folding Pocket Knife ! Rubberized Pink Camo Coated Aluminum Handle! Type: Assisted Opening; Closed: 4.75"; Blade: 3.5", Stainless, Standard Edge; Handle: Black, Aluminum; Other Info: Extended Tang, Lanyard Hole, Pocket Clip, Thumb Ridge, Thumb Stud(s). Urban camo finish blade. 440 is hard enough to hold an edge but soft enough to sharpen easily with a common whetstone. The HC stands for High Carbon but it is lower than 440. The reason for their switch is that 420HC costs less than 440. 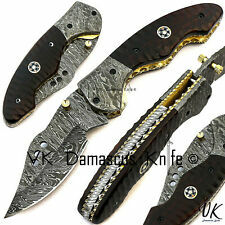 HANDMADE DAMASCUS STEEL POCKET FOLDING KNIFE LINER LOCK. BOLSTER = DAMASCUS STEEL. FIRE STORM pattern Damascus steel blade, having sharp edge for cutting. Damascus steel of this knife has high quality contents to give an excellent edge and sharp cutting abilities. Elk Ridge Pink Camo Linerlock Knife ER120 3" closed. 2 1/4" 440 stainless black coated drop point blade with dual thumb studs. Pink aluminum handles with camo scales and elk laser cutout. Black stainless pocket clip. Whole Steel Handle: Mirror luster whole steel handle is eye catching and very resistant. Ergonomically design like thumb groove. Usage: Suitable and convenient folding knife for camping, fishing or mountain climbing, etc. New Elk Ridge Elk Ridge Linerlock A/O Carbon Fiber Pnk 4 1/4" closed. 3 1/2" mirror polished 440 stainless assisted opening clip point blade with dual thumb studs, extended tang and laser logo cutout. 3 3/8" stainless assisted opening partially serrated drop point blade with thumb slot and extended tang with lashing hole. Block style grooved aluminum handles with drilled hole design and integrated bottle opener and glass breaker. To ensure this handy little blade is always ready when you need it, the pink Chive is equipped with SpeedSafe assisted opening. The bead-blasted finish is easy to maintain. This Chive's handle scales are pink anodized aluminum over steel liners.